I hope everyone is having a lovely weekend. Mine's not been too bad so far, spent too much money but don't know what on (do you ever wonder where the money went when you empty your bags) on the plus side my OH is finally decorating the bathroom (I won't tell you how long I've been waiting). It has gloss white woodwork and it should have warm lilac walls when he's finished. Anyhoo onto my posting. 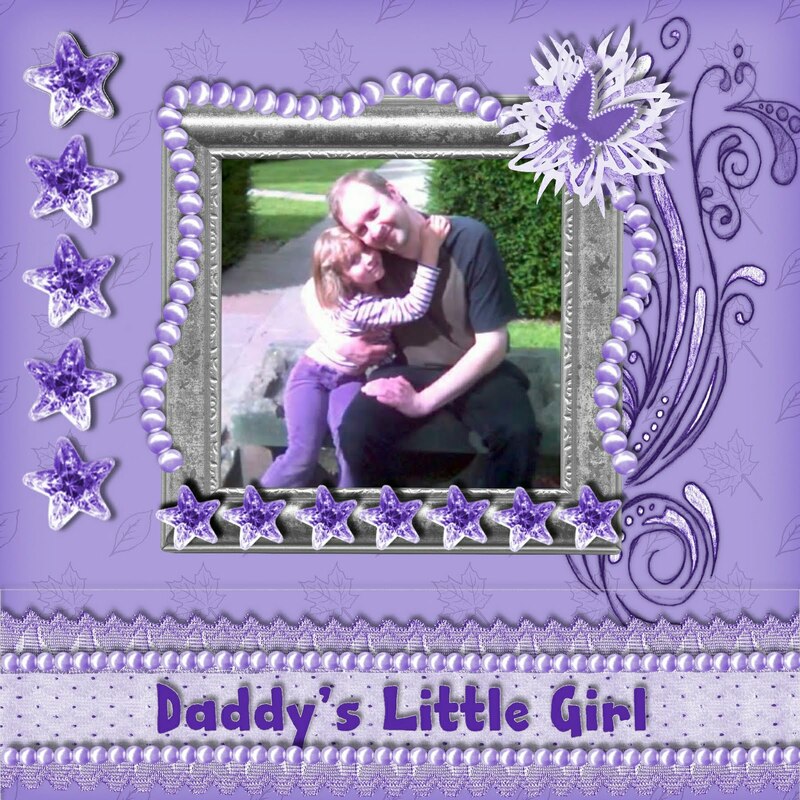 As I have already mentioned I have been practising with my CraftArtist program and am going to show you one of my favourite pages so far. I had forgotten about this photo so when I found it I just had to scrap it. My daughter is now 12½ and catching her on camera is very difficult I get plenty of hair and hands but not much face and I don't know why 'cause I think she's beautiful. Here is a gorgeous photo of her and her Dad at Wentworth Gardens which is inside Wentworth Garden Centre, near Sheffield. It's very purple because I was practising with the colour catcher and used colours from her trousers and stripy top. DON'T FORGET WE ARE HAVING A DT CALL OVER AT THE NEW CHALLENGE BLOG CRAFTING WHEN WE CAN HOP OVER AND CHECK IT OUT. Beautiful page, Poppet! I love how you pulled out the purple of your little one's clothes to the page. I love the sparkly stars. Thanks for your nice comments on my journal page. I really enjoyed them. Hiya. This is so beautiful and holds such happy memories. I love the colour too, great choice. Happy crafting. Oh wow sweetie this really is sooooo beautiful you have a very pretty daughter & she should def have more photo's taken of her. This really is gorgeous. I know what you mean about spending & then wondering what half of it has gone on........at the time you think wow I've got loads to show for what I've spent..........til you get home & its like someone has stolen half of your shopping lol. Hi Poppet what a gorgeous layout and a lovely memory to keep!